Explanation: What created the dust disk in the center of NGC 7052, and what keeps it spinning? Although the disk might appear as a relatively tame "hubcap in space", the unusual center of elliptical galaxy NGC 7052 is probably the remnant of a titanic collision between galaxies. What's more, the disk's spin indicates the tremendous gravity of a massive central black hole. 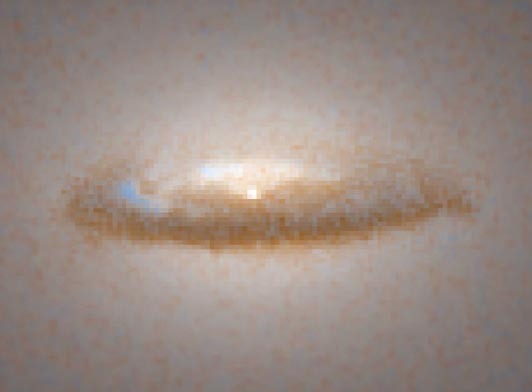 Analysis of this recently released photo by the Hubble Space Telescope indicates that the disk is thousands of light-years across, rotates faster than 100 kilometers per second, at a distance of 150 light-years from the center, and contains more mass than a million Suns. The theorized central black hole is thought to be yet 100 times more massive, and may swallow the entire disk in the next few million years.